Initially, I wanted a simple button. It didn’t take much searching to find a nice template for a button that used an SVG image for a clipboard. Having the SVG makes the button look pretty nice regardless of what size to which it’s scaled. As I progressed through the directive, though, I wanted it to handle ng-model bindings as well as simple attribute binding which would be evaluated. The directive, then, is really a click-event handler. 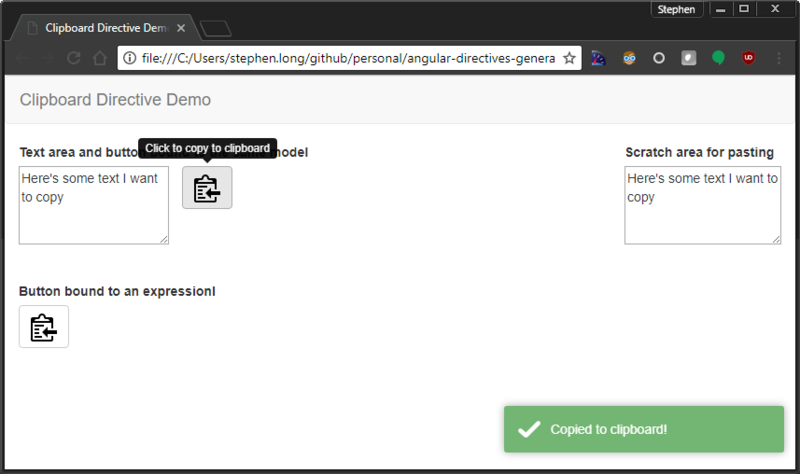 We only need to check for the presence of the ngModelCtrl and act accordingly; either evaluate the directive’s attribute or use the ngModelCtrl view value. The service utilizes the “document.execCommand” to issue copying of a hidden textarea that we copy the value to be copied into. This is necessary because the copy command works on the focused/selected element. You’ll also notice that in the case of a successful copy, I use my toasterService to let the user know. And, in the case of an exception, my dialogService will let the user know that nothing was copied and that they will have to use Ctrl-C themselves to copy. A plunk is below. The first clipboard button copies from the textarea and the second clipboard button will copy from an evaluated expression that returns the current Date.